Nina Simone’s unapologetic rage and accusatory voice named names and took no prisoners in the African-American struggle for equality in the early 1960s. Her triumphant voice sang what it meant to be young, gifted and black in a sometimes unjust and troubled world. Nina Simone is one of 19 nominees in the Class of 2018. Information on the induction process is available here. Fans can vote for up to five nominees once a day. Voting is open through 11:59 p.m. on December 5. As of this writing, Ms. Simone is trailing behind in fan votes. An unvarnished truth-teller, Nina Simone worked her magic “for the whole round world to hear.” Let’s show her the love that’s in our hearts. Vote early and often. The Queen Mary Room was located in the Rittenhouse Hotel. Pep’s Musical Bar was one of Philadelphia’s most celebrated jazz spots. It brought in national jazz, blues, R&B and soul greats, including Aretha Franklin, Jimmy Rushing, Nina Simone, Dinah Washington and Yusef Lateef. Philly favorite John Coltrane frequently performed at Pep’s, including September 18, 1964. I remember seeing the great pianist-chanteuse Nina Simone at Pep’s Showbar at the corner of Broad and South Streets in South Philly in the early 60s. At that point the club had already been one of the great East Coast haunts for jazz performers and aficionados for two decades or more. Nat King Cole had played there, and so had Count Basie and Duke Ellington, Lester Young and Billie Holiday, Dinah Washington, Nancy Wilson, Thelonius Monk, and Jimmy Smith. Going to Pep’s was a jazz pilgrimage. She was an incomparable artist and played much of that wonderful mix of music at her Pep’s engagement. Starting off with an extended version of the great blues “Trouble in Mind”, followed by a stirring, elegiac jazz/classical version of “You’d be so Nice to Come Home to.” Then some Ellington and more blues. The audience knew it would all lead up to “Porgy” for a grand finale. About a half hour or so into the show she had gently just begun to swing into “My Baby Just Cares for Me”, when she suddenly stopped playing. Just stopped, her high-coiffed head bent over the keys and the sidemen trailing off. The place got quieter and quieter ’til you couldn’t even hear an ice cube clink in a glass; there was complete silence … except for two thugs at a table in the corner who had been talking. Another 30 seconds in that vacuum and they looked up too, and found Miss Simone glaring straight at them. From 1965 to 1975, Broadcast Pioneers member Sid Mark hosted a widely acclaimed television show, first carried by Philadelphia’s Channel 17, WPHL-TV and then later aired by WHYY-TV, Channel 12. “The Mark of Jazz” was THE broadcast of that era for jazz. SM: And one of the people I was actually responsible for when it came to her success was Nina Simone. AAJ: I know that Nina spent some time in Philadelphia. SM: She started her career in Philadelphia. In her autobiography, she said the reason for her success was a white Jewish disc jockey, Sid Mark. She said, “If I knew him today, I don’t know if I’d kiss him or smack him in the mouth!” (laughter.) That’s a quote. We had a hell of a relationship! By the way, did the tribute concert by her daughter ever take place? AAJ: It was performed at Town Hall last year. From what I understand, it was extremely successful. SM: I love that picture of the two of them together. AAJ: She’s been very active in promoting Nina’s legacy. SM: Nina was something else. We had hours of discussions on the numerous radio and TV shows we did together. When I discovered her, she was just playing piano at a little joint in Philly at 22nd and Chestnut. It was a bar, and she wasn’t singing, just playing the piano. The Curtis Institute of Music is a conservatory located in Rittenhouse Square. According to U.S. News & World Report, it has the lowest acceptance rate of any college or university (3.2%), making it the most selective institution of higher education in the United States. At the age of seventeen, Simone moved to New York to take classes at the Juilliard School of Music in New York. She then moved with her family to Philadelphia, where she auditioned for the city’s prestigious Curtis Institute, a conservatory of classical music. Simone sought the help of a private instructor to help her audition for the Curtis Institute, but was ultimately denied after a supposedly excellent audition. Simone said she later found out from an insider at Curtis that she was denied entry because she was black. This heightened her anger over the racism which was pervasive in the United States during this period. NB: The Curtis Institute awarded Nina Simone an Honorary Doctor in Music and Humanities two days before her death in 2003. This year marks the 115th anniversary of the birth of Mary Lou Williams. Since 1995, the John F. Kennedy Center for the Performing Arts has paid tribute to the legendary pianist and composer with the Mary Lou Williams Jazz Festival. Williams is the subject of a new documentary, Mary Lou Williams: The Lady Who Swings the Band. The film premiered on public television on April 1. Missed it? If you’re in the Philly area, you’re in luck. There will be a screening of the documentary on Tuesday, July 14, at the International House. Hosted by the Scribe Video Center, the screening and conversation with director Carol Bash is co-sponsored by the Leeway Foundation, Philadelphia Jazz Project, Ars Nova Workshop and Reelblack. Sadly, luck is running out on the Women of Jazz mural, which depicts jazz icons including Williams, Billie Holiday and Nina Simone. This cultural asset is on the Philadelphia Housing Authority’s chopping block. On June 1, I provided public comment before the Philadelphia City Council Committee on Housing, Neighborhood Development and the Homeless, which is chaired by Councilwoman Jannie Blackwell. 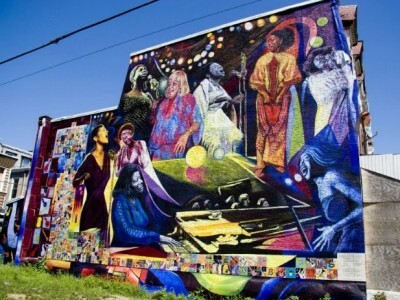 I brought to Blackwell’s attention the Philadelphia Housing Authority plans to demolish the mural. I made it clear the goal of increasing the availability of affordable housing and preserving the City’s jazz heritage is not mutually exclusive. COUNCILWOMAN BLACKWELL: Thank you very much. So you’re saying they’re slated to tear down the mural? MS. ANDERSON: Yes. The Women of Jazz mural at 3200 [block] of Arlington. It will be torn down sometime this year. The date to be determined. COUNCILWOMAN BLACKWELL: All right. I’m happy to work on that. The complete transcript is available here. Clap along if you’re happy.